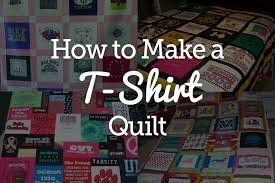 In this workshop, we will explore one of the many ways to make a T-shirt quilt. No stabilizer required. Which makes the prep quick. And the math easy. Even if you have lots of different sized of shirts! This method is perfect for those wonderful jerseys, you know the polyester ones with the holes in them that can't be ironed! Bring what you have (just be sure they are clean!) and we'll tackle the rest in class! Instructions and demo are fairly quick, then it's off to the rotary cutters and machines for a full day workshop! Requirements: Must be able to sew a fairly straight line. Must be confident with your own sewing machine.